One of the best decisions I made during the completion of my degree was to take an industrial placement year between my 2nd and 3rd years of study. This allowed me to transfer much of the theory and practical skills developed at University into a commercial setting. Having studied both Computing and Mathematics to A-Level, Computer Science was a natural progression. Having visited Manchester for an open day I had decided that it was there that I wanted to continue my education. The team project in first year was a great way to meet new people, as from week one you are working with people who are in the same situation as yourself. The course is varied, with lots of themes to specialise in during second and third years, there is always a chance to pick the modules you are interested in studying. One of the best decisions I made during the completion of my degree was to take an industrial placement year between my 2nd and 3rd years of study. This allowed me to transfer much of the theory and practical skills developed at University into a commercial setting. Working for Isatec Ltd., a small business based in Buckinghamshire, meant I was ‘thrown in at the deep end’ with respect to the development of new software. My team on placement was multidisciplinary, including the business development manager, directors and electronics engineers. The education I had received from the first two years of my degree put me in a position to be able to actively contribute to the team, and I was solely responsible for implementing a web based front end for a data collection system which began development early on in my placement. One of the most important things about being in a small business is being flexible, so I gained experience performing other tasks than just programming, including meeting customers and even selling my own software. 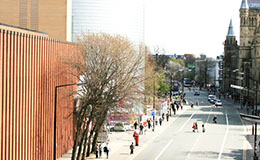 Upon my return to Manchester to complete the final year of my degree, the placement had focused my attentions into certain areas of Computer Science. One of the best things about the placement however was that Isatec Ltd. had already agreed to employ me post-Graduation, which meant that I didn't have to spend my final year looking for a job.